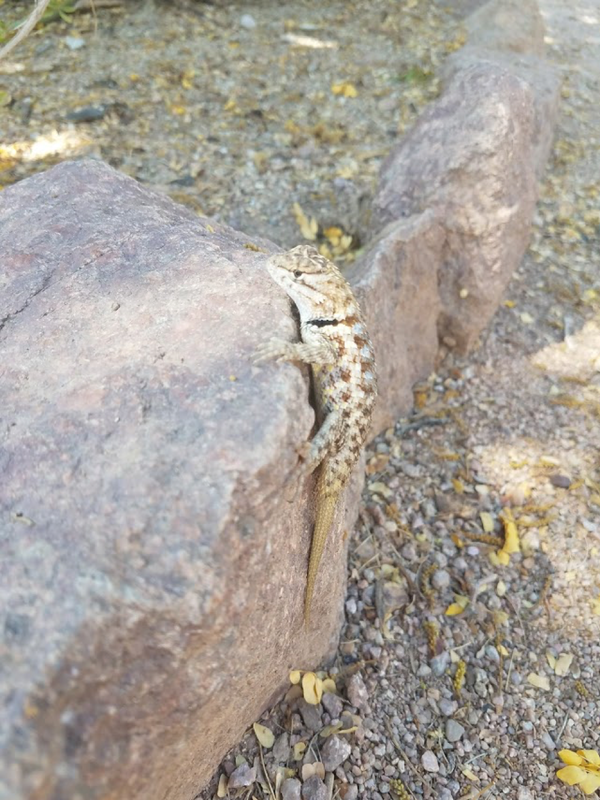 I have been living in the Sonoran Desert in Arizona for the last 2 months doing undergraduate research at Arizona State University, and I have enjoyed every scorching minute of it. The problem with deserts is people have this misconception that the desert is not full of life, is not beautiful, and is barren. This misconception is very, very wrong; people are just misinformed or have not experienced the desert themselves. The desert is a fully functioning ecosystem like every other with many interesting adaptations to the hot, arid climate. Temperatures in the desert range from freezing to over 100 degrees Fahrenheit. An organism’s water needs increase with the temperature increase, but water becomes scarcer as the temperature rises. Many have evolved strategies to seek or store water carefully and efficiently. Evolution has created many adaptive strategies for desert organisms. Because of this, many mammals and birds simply avoid the daytime by being nocturnal; the desert comes alive at night. Other animals will seek out a cool microclimate like that of a cool mountain ledge, crevice, rock pile, or shade. I personally notice small lizards that sprint across areas of sun and stop in the shade to rest on their route to wherever they are going. Some create their own microclimate by creating burrows underground, or others (like the pack rat) build dens with whatever they can find and spend the day in their shaded nest. The adaptation that helps even us humans in this climate is evaporative cooling. As water evaporates from a surface (our skin), it cools the surface. Because this climate lacks humidity, evaporative cooling is always happening, creating the illusion that we are not really sweating. We are, it just evaporates almost instantly. One thing I quickly learned in the desert is that I should have been drinking a lot more water because of this cooling process. Another human advantage to living in this climate is that we walk on two legs, minimizing our skin’s exposure to the sun and only having 2 (not 4) contacts with the hot ground. Animals on the other hand have most of their back exposed to the sun. The first thing that comes to mind when people think of the desert is probably cacti or succulents. These terms cannot be used interchangeably which is another problem people have with the desert. All cacti are succulents, but not all succulents are cacti. Succulents store water in their stems, roots, and leaves to cope with the lack of rain in the area and have about 60 different plant families attached to their name like aloe, haworthia, and cacti. Cacti are simply a family within the group of plants collectively known as succulents. To be considered a cactus, a plant must have areoles (small, round mounds of flesh where spines, leaves, and flowers grow). They are on all cacti, but not all succulents . Maybe the most notable of all cacti are the Giant Saguaro; they are so abundant in the valley region of Arizona. This plant only grows in the Sonoran Desert and can live 150 or many more years. They can only grow an arm when they reach a ripe age (many say 50 or above, others say 75 or above). Saguaros absorb rainwater and visibly expand when doing so, slowly using the water as they need. This characteristic helps it survive long droughts. When it is fully hydrated during a period of plentiful rain, it can weigh up to 4,800lbs! Another notable cactus for people living in the area is the Prickly Pear. This cactus is unique in the sense that it can be green or purple and its leaves are shaped like ping pong paddles. I personally like this cactus because of its uses to humans (and its purple coloring). The Prickly Pear produces a fruit that many people eat, cool, make pink/purple syrup out of, etc. I personally like adding the syrup to lemonade or iced tea, but Prickly Pear margaritas are a regional favorite. These fruits are mostly water, which makes them a primary food source for animals. During my time here, I have noticed the true beauty of the desert. A landscape covered in Saguaros, Prickly Pears, succulents, mountains, some red rocks, flowering plants of all colors, green-barked Palo Verde trees, and much more has become a second home to me. It is aesthetically pleasing; there is life and color everywhere. The horrors of the desert to many (the heat, bugs, and rattlesnakes) have become something I respect and look at from an eco-centric point of view. Nothing is trying to bite you; respect nature and it will respect you. The desert plants and wildlife have evolved and adapted to live in one of the harshest climates on the planet. In my opinion, this makes the desert one of the most alive and resilient biomes on earth and breaks every negative stereotype people have about it.